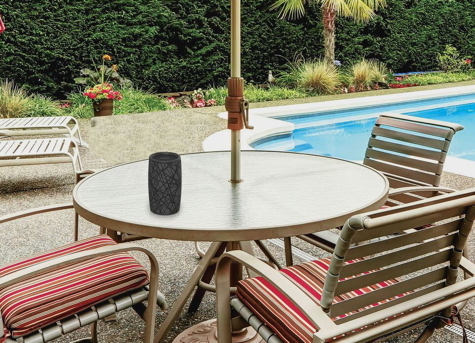 iHome’s multi-talented Melody Bluetooth Speaker has many tricks up its sleeve. In addition to producing impressive audio, you can use the free, voice-powered Melody app to summon music from Spotify, iHeartRadio, and other services. You can also receive phone calls with its speakerphone feature complete with audio Caller ID. The iBT77 is a water-resistant, rechargeable, Bluetooth speaker. It is splash-proof, sweat-proof, and rainproof (iP65 rated.) The swirly ribbed covering is reassuringly grippable even with wet hands. The curved conical shape measures 5.75 inches tall by 3.25 inches diameter (8.45 x 14.6CM.) It is available in four colors. Bluetooth pairing has come a long way; set-up is fast and easy. The iBT77 is rechargeable and a USB cable is included. A single charge will yield up to 16 hours of audio playback. Since this speaker is designed for rugged indoor and outdoor use, a carrying strap is included. Much of your interaction with this speaker is done from your iPhone but in addition, there are four rubberized buttons on the back: Volume up/down, a button that speaks the amount of battery charge remaining, and a multi-purpose button. This button is used to initially pair the unit with your phone, it is also a physical play/pause control, and it manually activates the speakerphone if necessary. There is a waterproof cover that hides the micro-USB socket for charging and a 3.5mm audio-in port. This allows you to play music from other audio sources. Considering that the top-firing speaker with passive subwoofer is only about 2.5 inches (60mm) in diameter, the unit sounds good. Surprisingly good. Max out the volume and there is no distortion in its room-filling sound. I was prepared to be dismissive of the sound quality from such a small speaker, but it turned my head. Don’t expect floor-shaking bass notes but your music can be played loud and clear. iHome has included circuitry that allows a pair of these units to be wirelessly linked for stereo listening. This Li’l Speaker That Could produces impressive sound for its size.